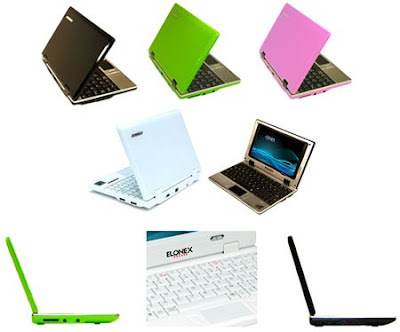 Elonex is apparently following up on the success of the company’s Elonex One laptop with a new model, called the Elonex One T. The Elonex One was a bit different from other netbooks in that all of the PC components (storage, RAM, CPU, and so on) were hidden behind the screen. The result is that you could remove the keyboard and use the PC in tablet mode. But in clamshell mode, the computer seemed a bit top-heavy and funny looking. The Elonex T will feature a more traditional clamshell design with all the good stuff hidden away beneath the keyboard. The PC will have a 7 inch, 800 x 480 pixel display, 1GB of flash memory, a card reader, 802.11b/g, VGA output and 3 USB ports. No word on RAM or CPU, but the machine will reportedly sport a 400MHz processor. While it’s a little tough to tell from the photos, the PC bears a striking resemblance to the 3K RazorBook. Elonex wouldn’t be alone in offering a RazorBook clone. At least half a dozen companies have slapped their own names on similar machines. Although I haven’t received confirmation on this, it appears that the original equipment manufacturer is a Chinese company called Skytone. The Register reports that Elonex will charge £129, or about $254 US, which certainly makes the Elonex One T one of the cheapest subnotebooks around.